Examining a beer bottle from an early 19th-century wreck in the Baltic Sea. Photo: VTT Technical Research Centre, Finland. If the 168 bottles of Veuve Clicquot and Juglar types of champagne recovered from an early 19th century wreck off the Åland archipelago at the bottom of the Baltic Sea are not to your taste – or at an expected $70,000 a pop don’t suit your wallet – fear not. It seems the ship, found between Finland and Sweden, catered for all tastes and occasions. Five bottles of beer from the wrecked schooner are now being heralded as amongst the world’s oldest preserved pints. 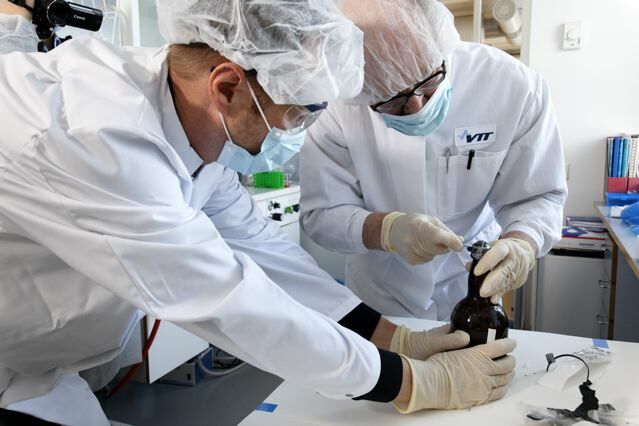 The VTT Technical Research Center of Finland hopes its analysis of a sample of the ‘pale ale’ will determine the original brewing recipe through identification of microbes, such as yeast or lactic acid bacteria. VTT scientist Arvi Vilpola has had a sneaky first gulp of the brew and reported that “It was a little sour and you could taste the saltiness of it slightly.” The team hopes to use these remains to bring the beverage back to life for modern consumers. Chateau Jiahu, a Neolithic beer available from the Dogfish Head Brewery, Delaware. All good fun, but for age this is literally small beer compared to the hard stuff knocked out by early Celtic revellers at Eberdingen-Hochdorf in southwestern Germany. Excavations in a series of 2,500 year-old ‘industrial’ ditches were stuffed with thousands of barley grains from high-quality barley malt, a key ingredient of beer. Even millennia older than Celtic and Egyptian beer, however, is the 9,000-year-old hard stuff recreated by an American brewery after analysing the linings of Neolithic pottery found at a burial site in Henan province in central China. The brew was identified by Dr Patrick McGovern, a biomolecular archaeologist at the University of Pennsylvania, after he came across sherds from the Neolithic village of Jiahu in Henan province. The Dogfish Head Brewery in Delaware has started making Chateau Jiahu from wildflower honey, muscat grapes, barley malt, hawthorn fruit and chrysanthemums. The wort is fermented for about a month with Sake yeast until the $13 a bottle beer is ready for packaging. This winter there’s plenty of options for all manner of adventurous tipples – salty malt, Billy goat beer or fruity Dogfish brew. Or you could just go down the pub.